After a fairly pleasant recent trip to Boston, we decided to take some back roads to get over to Route 3 to go home through Nashua, and decided it would be a good opportunity to stop for lunch, taking us right down Main Street in Tewksbury, MA. This isn’t completely terra incognita for me (you can read my review of the rather nice Vic’s Waffle House from a previous trip through), but I’m not all that familiar with the area, and mostly found myself staring at typical “North of Boston” fare: a lot of chain restaurants with the occasional roast beef or seafood place. 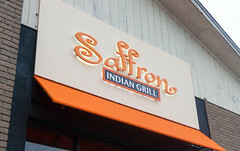 But not far down the road from Vic’s we saw a promising place: Saffron Indian Grill. Arriving at a slightly early hour for dinner, we had the place to ourselves in a nicely decorated dining room. Despite the early time, the staff (primarily one waiter) was quite friendly and outgoing, walking us through the menu and various specials. We soon found ourselves ordering a handful of appetizers, a few different breads, and some daal soup. 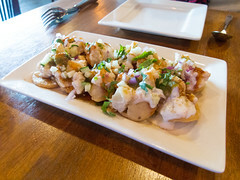 Shortly after, our appetizer arrived: a plate of “street style” Dahi Papri Chaat, mini pooris filled with a mix of chickpeas, onions, tomatoes and yogurt. Each was a nice, fresh crisp little poori with just enough filling to be full but not overstuffed, with the filling tasting much like a nice chana masala. I’d definitely get this as an appetizer again. 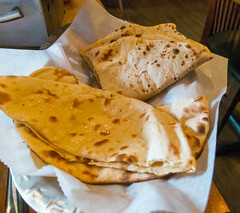 For me, one of the true attractions of Indian food is good bread (oh, some of the sublime naan I’ve had over the years), and here we opted for a combination of chappati and tandoori roti, giving us two closely related versions of nominally the same bread (one griddled, one roasted with butter). And both were particularly nice: a good, slightly chewy and flavorful wheat dough with a lot of gluten stretch to it, cooked up with a very pleasing amount of light charring, I was definitely not disappointed in their bread. Next, a daal soup. 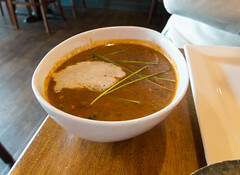 While a simple mix of blended lentils, broth with a nice clove-forward spice, this was a very enjoyable light soup, perfect for dipping the roti in. 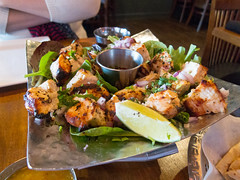 But the main attraction was the main course Carol and I split, Lasooni Chicken: a yogurt and coriander marinated chicken grilled perfectly to the point of starting to lightly char, each piece of chicken was tender, crispy, and very nicely seasoned. Spice-wise, despite some warnings, none of our dishes were terribly hot, but they were all very nicely aromatic and flavorful; it’s good when I can get Indian that’s flavorful along with spicy. I’d definitely want to get this on a future visit. All things considered, we really liked Saffron. It was a lot better than a good number of Indian places in the greater Boston area I’ve been to, the food was a nice mix of “street” and traditional Indian food, and the staff very pleasant. We got a very good amount of flavorful and spicy food for a reasonable cost; I’m definitely going to consider a repeat visit if I’m in the area, especially to try some more dishes. Sometimes it pays off to take the back roads and shortcuts. I’ve always found Yuma to be a bit challenging when it comes to finding a righteous breakfast. Actually, on my previous trips, my best breakfasts have all been out at the Proving Ground, that being the breakfast burritos from the bowling alley, and Sidewinder Cafe (the food truck across from Luguna Airfield and the Free Fall School). And in town, I’ve done all right at Brownie’s Cafe, and found that Arizona Donut has a surprisingly good breakfast burrito, but in general, I haven’t been wowed. However, on last June’s trip to Yuma, I took a shortcut from Burger’s n’ Beer on 20th street back to my hotel on Hwy 95, which took me through the residential area east of 4th Ave. Heading north on 1st Ave, between 19th and 20th Street I saw this little unassuming neighborhood grocery store call “Stan’s Grocery”, and I noticed their sign said “Voted Best Breakfast Burritos in Yuma.” I put it on my Hit List as a place to check out the next time I’m in town.